Whether you are looking to relax your muscles after a hard day’s work or relieve an injury, heating pads are the ideal choice. Considered a health product, choosing a quality pad from a known brand is vitally important for better benefits and longevity. But there are several methods for applying heat. First of all, there is the debate of whether to apply dry or moist heat to aching, sore muscles. Then there are a number of designs to the actual heating pad. There are chemical heating pads, where an exothermic chemical reaction in the pad is what produces the heat. Then there are microwaveable heating pads, where you heat a bag containing plastic beads (or even rice or oatmeal!) in a microwave for a few seconds, and the pad gives off its heat over the next half-hour or so. Then there is the traditional electric heating pad, which you plug into the wall. Some have a number of heat settings, so you can program to the desired temperature. Chemical Heating Pads: Easy to use, chemical heating pads are heated by chemical reaction. Most of these pads are disposable but some can be reset by boiling the pad. Ideal for emergency situations, they offer instant heat therapy. Chemical heating pads will usually involve mixing sodium acetate with water by pressing on a metal ring in the pad. The sodium acetate crystallizes into a salt, yielding heat. When you put the pad in boiling water, the sodium acetate crystals dissolve once again, so that you can reuse the heating pad. The Hot to Go Reusable Heat Packs employ such a chemical reaction--you can reheat the packs by placing them in boiling water. 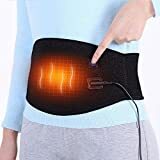 Electric Heating Pads: Electric heating pads offer users the most flexibility in heating, as they more often than not have adjustable heat settings. Using electric power to heat up, they can be reused as often as needed and are a convenient solution for home use. 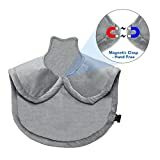 Microwavable Heating Pads: Offering a better value solution, microwaveable heating pads require a quick moment in the microwave to heat up and then gradually reduce heat over time. These are the best heating pad solutions if your main purpose is relaxation. For example, the Beady Heat Microwavable Heating Pad is a heating pad that contains plastic beads that you warm up in the microwave for 20-40 seconds. It provides heat for 20 minutes afterward. Warranty: One of the most important reviewing points by consumers is the warranty offered by the heating pad brand. Heating pads are an investment and if something should go wrong, a valid warranty is essential in avoiding buyer’s remorse. Most companies warn that you should not try to repair the heating pad yourself--for example, the makers of the Thermophore heating pads recommend sending any defective product back to the company, instead of improvising and effecting repairs at home. The Sunbeam Ultra Soft Heating Pad offers a 5-year limited warranty. Features: When it comes to electrical heating pads, owners rate heating pads higher if they include the features the user needs. Auto-shutoff is a big talking point of heating pad features and consumers that choose a pad that has (or doesn’t have, depending on their needs) auto-shutoff are much more satisfied. Comfort: Heating pads that mold comfortably to the contours of the user’s body are rated very well, while pads that don’t aren’t as liked. Pliable, soft fabrics perform better at this and choosing a quality pad of a similar material will ensure more comfortable use. Moist Heating: The majority of heating pad owners bought their model for chronic pain and therefore rate heating pads that offer moist only or combination moist and dry heating much higher than devices that don’t have it. Choosing a heating pad based on your needs will ensure you find the right product for you. 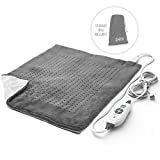 Long power cord: If you use an electric heating pad, having a long cord will allow you more convenience in using the pad (you don’t have to be next to an outlet in order to use it, and you can apply it to your legs or back with greater ease. The Sunbeam Ultra Soft Heating Pad has a 9-foot power cord, which is very convenient. How to choose the size of the heating pad: What area of the body do you need a heating pad for? For the best fit and results, choose a heating pad designed for the area of concern. For very specific, localized areas, consider a heating wrap instead of a pad; especially for joints like shoulders or knees. The Sunbeam 002013-912-000 King Size XpressHeat Heating Pad is 12” by 24”, making it large enough to cover your entire back or thighs. The Thermophore Classic Heat Pack (Model 055) is even larger, and measures 14" x 27". 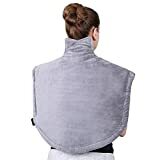 At the other extreme, you can use the Beady Heat Microwavable Heating Pad measures 10" L x 5" W x 2" H, so that you can warm a specific area: that’s good for abdominal or menstrual cramps, earaches, and stretched muscles in just a particular area. The flexibility of the pad: When choosing a heating pad, look for models with flexible fabric that will mold to the contours of your body and will thus offer better comfort. Prefer medium heat: When it comes to temperatures, the idea is to heat the muscle, not the skin, and a recommended gradual low to medium heat works better than a high heat. The Sunbeam 2014-915 Xpressheat Heating Pad has a digital controller, LCD display, and allows 6 different heat settings. Easy to clean: For easy cleaning, look for a heating pad that is machine washable. Some, like the Sunbeam Ultra Soft Heating Pad, is made from vinyl, plush, and polyester, and can even be put in the dryer, on a low heat. A combination of electric and gel: Combination heating pads that offer electric and gel options will make your heating pad more portable and versatile. Dry heat, moist heat, or combination: Heating pads will either offer dry heat, moist heat, or a combination of the two. Moist heat generally is better for stiffness, spasms due to arthritis, TMD (= temporomandibular joint dysfunction, a condition where a person’s jaw locks when opening the mouth too wide), and the pain of muscle spasms. Dry heat can be more comfortable for relaxation, back pain, or muscle pain or stiffness. It is also good for increasing flexibility of joints and blood flow. 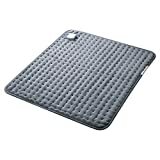 It requires less hassle to set up a dry heat pad. But there are also moist heating pads that conveniently collect moisture from the surrounding air, such as the Thermophore MaxHEAT Automatic Moist Heat Pack (Model #155). (In fact, rice and oatmeal have the ability to absorb moisture from the surrounding air, as anyone who put rice grains in a salt shaker can testify. This natural ability to absorb moisture makes it possible to create your own microwaveable moist heat heating pad, by stuffing a wool sock with rice or oatmeal and sealing it closed.). Choosing between the two is normally based on budget and preference, and combination pads that offer both will give you a chance to use both as needed. Multiple heat settings: Electric heating pads with multiple heating settings allow for more adjustments in temperatures and heating times. Auto-shutoff: For the safest use, consider an auto-shutoff feature, which means your pad will automatically shut off after an extended period of time (usually around 2 hours). This is will give you more peace of mind for extended use or for being able to use it before you fall asleep. “Auto-Switch” feature: There are a number of heating pads, such as the Thermophore Classic Heat Pack, which remain “on” only when you are pressing the power switch. This has two advantages: 1) you keep your finger on the switch until you reach the desired temperature, and 2) there is less risk of you falling asleep with the electric heating pad on, which can cause dry skin or even burns if the temperature gets too high. Don't apply heat for the first three days after an injury--since heat increases blood flow to the area, it will increase pain and swelling. You should apply ice or a cold compress to a wound for those three days. Don’t apply a heating pad together with pain relieving cream (like Icy Hot, Ben Gay, or Voltaren)--the combination of the two can lead to burns! But some say that you can apply a heating pad at low heat with such a mentholated cream. Don't apply heat to an open wound or to a bruise. Heat causes more blood flow, so it will cause the wound to bleed even more. Don't use if there is swelling or inflammation, and don't use after exercise (use cold instead--like pitchers in baseball, who apply ice to their arm after pitching a game). Don't apply a heating pad to people with circulatory problems. Don’t fall asleep: Be careful that you don't fall asleep while using the heating pad--it can dehydrate the skin, or even cause burns. By the same token, take care when using a heating pad if you are taking medication that causes drowsiness. Prevent burns: Take the precaution of putting a towel between the heating pad and your skin, so as to reduce the heat to a comfortable level. Sunbeam: An American brand started in 1897 by John K. Stewart and Thomas J. Clark, Sunbeam is known for producing quality electric home appliances: mixers, irons, humidifiers and heaters, toasters and countertop ovens, and heating pads. Their headquarters is located in Boca Raton, Florida. Their product list includes a line of top-rated heating pads: digital controlled, massaging, dry heat, and moist heat. Battle Creek Equipment: For nearly 80 years, Battle Creek has specialized in heating pads and other thermal products, offering good quality items at affordable prices. One of their brands is Thermophore, who make heating pads in a number of sizes and designs. Hot to Go: are developers of unique rectangular- and circular-shaped heat packs. You activate the heat pack by pressing on the metal disc in the middle of the heat pack. It reaches a temperature of up to 129 degrees Fahrenheit, and then gives off heat for 30-40 minutes, depending on the outdoor temperature. The pack can be reactivated by being put in boiling water. The company is located in Cincinnati, Ohio.